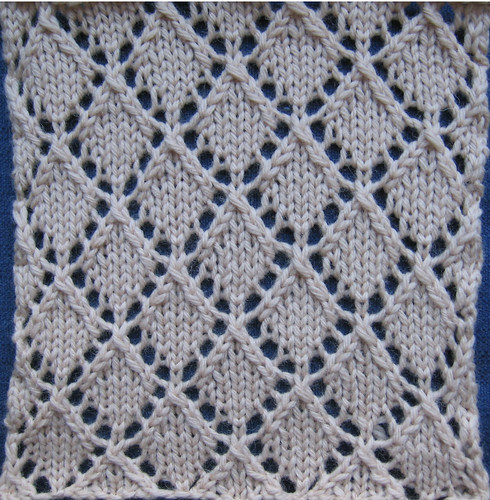 Notes: This swatch is three repeats wide and three repeats high. 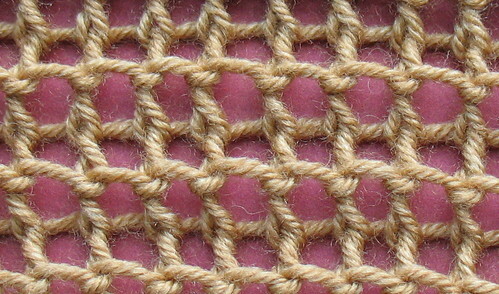 This is very similar to Fir Cone, the difference lies in the placement of the decreases. Comments: Swatch was inverted for the photos. I’ll replace them with right side up pictures as soon as I can. 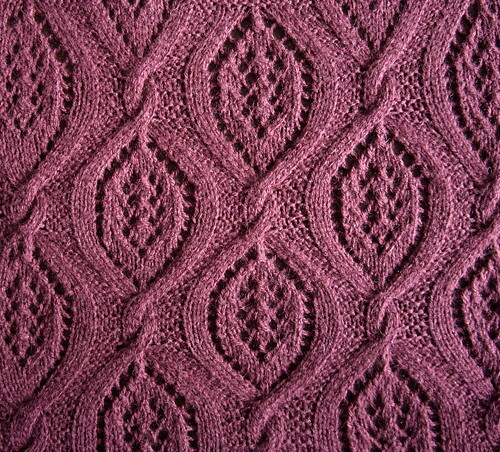 Knit by: Ursula19Because of increases and decreases necessary for leaf shaping, rows have varying number of stitches. 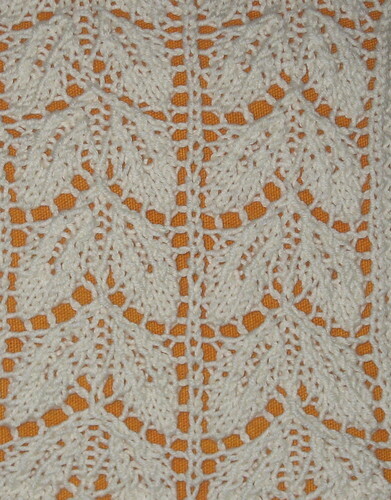 In rows 5 and 7 of the chart, stitches above the yarn overs are given as knit stitches. 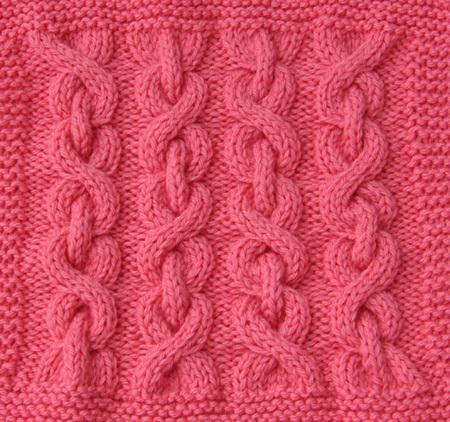 They should however be knitted as “knit through back loop” as indicated in the short discription for the pattern. 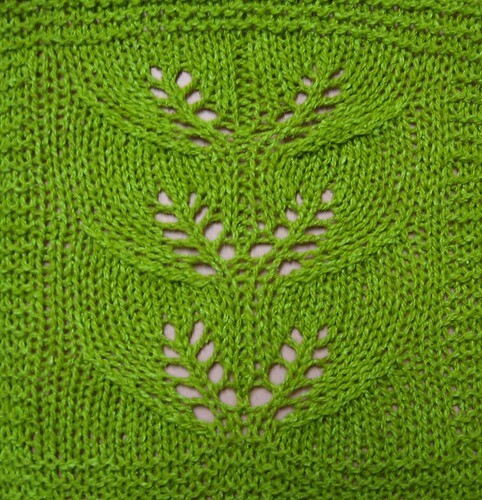 Yarn overs knitted as “knit” would create lace holes! Congratulations to the winners of the October photo poll! We’ve created some special new buttons based on the winning pictures. They’re in the buttons list to the right. 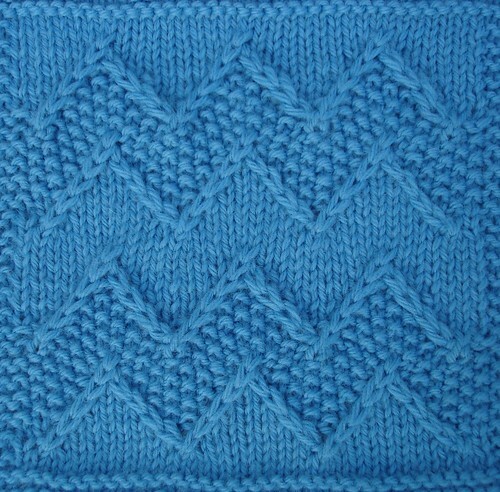 It really has been a fantastic few weeks, with volunteers contributing 50 new swatches since the beginning of October. 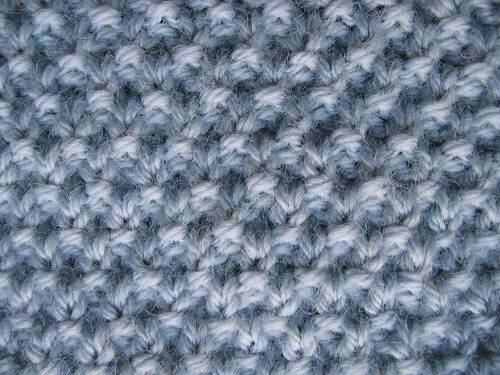 There are many more stitch patterns being worked on as we speak, so do keep an eye out for new contributions! A big thankyou to everyone for all their hard work. 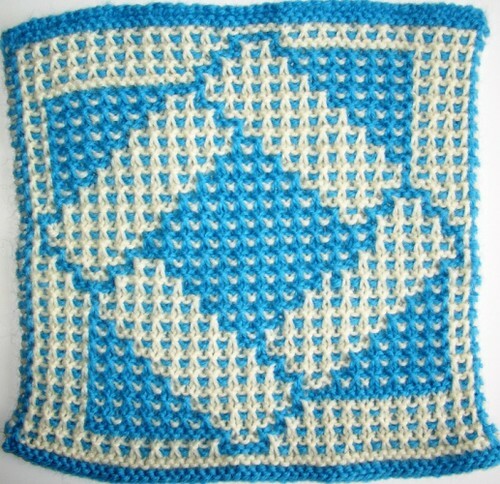 The Walker Treasury Project is back! A big welcome to our newest volunteers who signed up over the weekend. 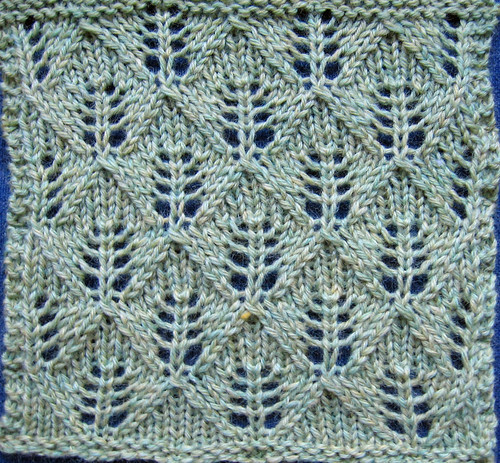 To celebrate our new swatch claiming system and ‘new look’ blog, we thought it would be fun to showcase some of the swatches that have already been contributed since the project was started in January 2007. We selected a variety of work, some of which comes from our most prolific contributors. Scroll through these photos and pick your favourite :) Remember its name and cast your vote in the panel at the end of this post! The poll closes at midnight (GMT), October 31st. The results will be announced shortly thereafter. 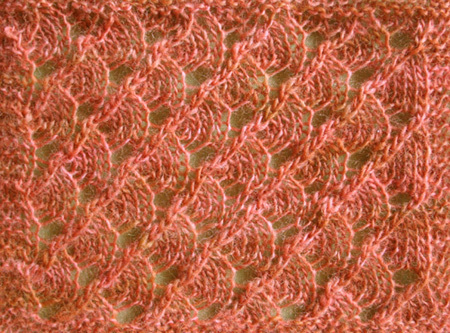 All images in this post are linked back to flickr on the individual swatch pages. 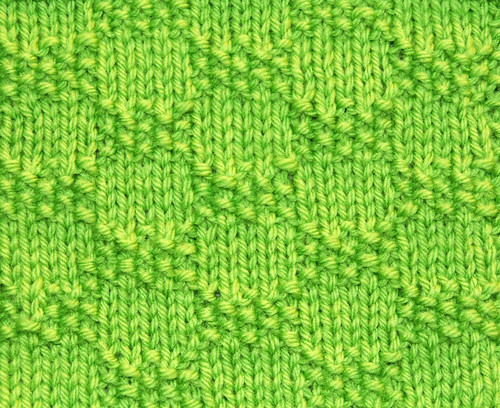 Notes: This swatch is four repeats wide and four repeats high. 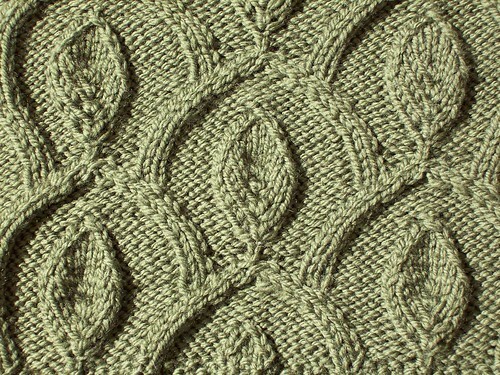 This pattern is extremely similar to Openwork Leaf Pattern – the difference lies in the placement of the decreases.